While motherhood is a very rewarding experience, childbearing changes the body in many different ways. Katy plastic surgeon, Dr. Rolando Morales, performs mommy makeovers to reverse and correct the visible, unwanted signs of childbearing, breastfeeding and childbirth for patients in Houston and Katy. With a mommy makeover, Dr. Morales can renew the breasts, re-contour the body, eliminate excess fat pockets, and rejuvenate the skin for a more youthful, vibrant appearance. Each Mommy Makeover is specifically tailored to meet the unique individual needs of mothers who want to look and feel their best. "36 year old, mother of two teenage girls. Mommy makeover (TT, lipo on flanks and BA) - Where do I even begin? 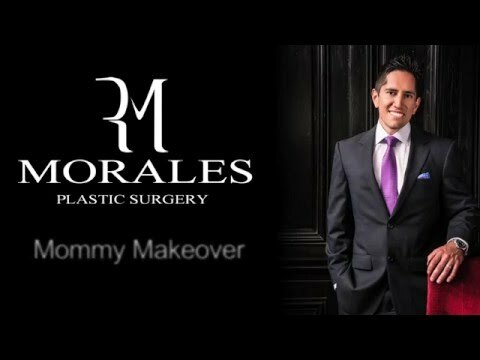 I had several consultations throughout the years with several surgeons in the Houston area and in San Antonio and Dr. Morales was the best one by far. I am a very analytical person and first impressions are the most important, so when I met Dr. Morales, I was able to identify that he was a perfectionist. I knew that without a doubt his work was going to be phenomenal. I met many surgeons and they were willing to do what I wanted them to do, but Dr. Morales was very specific and stated that if I was looking for exaggerated results that he was not the doctor for me. Dr. Morales asked me several questions to figure out my lifestyle because he wanted me to maintain my natural appearance as much possible. I was not sure as to what I really wanted, I had many questions for him, and he patiently answered them all. I felt convinced that the mommy makeover procedure was the best choice and he was right! Dr. Morales' persona and professionalism never change throughout the follow-up appointments, just as he was interested in my wants, needs and concerns on the very first consultation, he always remained the same. I have referred him to all my friends and will continue to do so as he was THE BEST surgeon I have ever met as I do not have a single complaint. I am extremely happy with his service and with my results just as he promised." "36 Years Old, 3 Boys and in the Best Shape Ever!!! - Best Doctor ever!!! I did research for months before I found Dr. Morales. He has been so good to me and I feel great!!! I went from a size 14 in dress to a size 4-6, from a size 34 in jeans to a size 27 and am still loosing inches!!!" One of the most common effects of a recent pregnancy or breastfeeding is looseness or excess skin due to stretching and loss of breast tissue density, giving your breasts a sagging appearance. Breast lift surgery, medically referred to as mastopexy, eliminates extra skin and tightens the remainder for firmer, perkier, more youthful-looking breasts. Breast lift surgery can also be performed in combination with breast augmentation to rejuvenate the breasts by adding breast volume. Often, the best answer is a combination of the two. After childbearing, the breast tissue is often deflated and has lost both perkiness and volume. Breast augmentation adds fullness and volume to the breasts for a more contoured, aesthetic appearance. Breast implants, available in a variety of sizes, shapes, and types, can improve the appearance of breasts that have lost volume or fullness after pregnancy or breastfeeding. After pregnancy or weight gain, excess pockets of fat can appear in a variety of body areas that can be very difficult to get rid of. Liposuction is an effective option to eliminate fat deposits in the abdomen, back, hips, love handles, arms, thighs, neck, and other areas. This procedure addresses the most obvious area of physical change after pregnancy: the stomach region. During pregnancy, the abdominal muscles are stretched and pulled apart, which allows loose skin to accumulate in the midsection. A tummy tuck pulls the abdominal muscles together, eliminates excess skin and fat, and tightens the remaining skin for a smoother, flatter appearance. A mommy makeover is performed under general anesthesia. The length of the surgery depends on which procedures are being performed. For all three procedures (breast lift with augmentation, tummy tuck and liposuction) the procedure typically lasts about 6 hours. During the first ten days after surgery, discomfort, as well as bruising, is common. It is important for patients get up and move around several times a day to help speed the recovery process and reduce the risk of blood clots forming in the legs. Each patient will recover in various ways and in varying lengths of time, though most patients find that they can go back to work within 2 to 4 weeks after surgery. Strenuous activity and heavy lifting will need to be avoided for about 6 weeks. It can take a few months for all swelling to clear up, and scars to fade over time. Mommy makeover procedures will vary in cost depending how many surgeries were combined, and how many surgery sessions are needed. At a minimum, the cost could range from $15,000-$20,000. Yes, it is possible to combine a mommy makeover with a hysterectomy or c-section, but is not recommended. Combining intra-abdominal procedures with a tummy tuck increases the risk of complications, such as bleeding. In the event of intra-abdominal bleeding, the tummy tuck incision would have to be taken down, which may compromise final results. It is preferable to undergo the two types of procedures separately as this reduces the risk of complications as well as reduces the post operative recovery. Every person recovers differently. The recovery period depends on how many procedures were performed at the same time. The average return to work is about 2-3 weeks. The average return to routine exercise is no sooner than 2 months. Post-operative swelling usually persists for several months after a tummy tuck. The abdominal muscle tightening requires an appropriate amount of time to recover, and is usually painful if strained too soon.